The TSA guards in the Maui airport are surprisingly nice. Consider this: While waiting in line to leave Maui, they were asking visitors what we liked best about our trip. Some people said the beach; others said surfing; I said eating papayas. Want a beautiful beach? Go to Florida. Want to surf? Go to California. Want a tantalizingly sweet and custardy papaya? Go to Maui. And if you can't, then make this smoothie. You don't need ambrosial Maui papayas to make one. 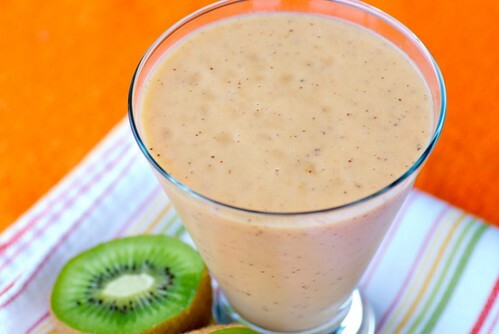 Any sweet papaya and tart kiwi will make a refreshing combination. Although I will admit that it does taste better if you drink it while wearing a Hawaiian grass skirt. We definitely don't have TSA guards that nice here in NYC. Maybe we should fly them down to Maui. For lessons. And while they're there if they could bring back some perfect papayas so that I could make this. That would be nice too. I live in America's Heartland, yet I am absolutely in love with all the tropical fruits and flavors! I seldom see papaya in our grocery stores. Guess, I need to check with a good travel agent! I am doing a cooking demonstration at a breast cancer event in which the focus is how to eat healthy during and after chemo treatment. Smoothies are easier to handle when your appetite isn't all there, and are quick to fix. I may add this recipe to my demo--sounds refreshing, and has me dreaming of Maui. joanne-They're even nicer than the ones in San Diego, and that's saying something. vincent-Thank you. I'll look into it. debi-What a smart choice for a talk. I'd be honored if you included the smoothie. Thanks! My son (a very picky eater!) loves kiwi fruit, so I'm going to have to try this. It's so healthy and good for him. And it's easy for me. Thanks! Wish TSA had been that kind on my travels! Our kids love smoothies. I find it's such a great snack + a good way to get fruit/veggies in.